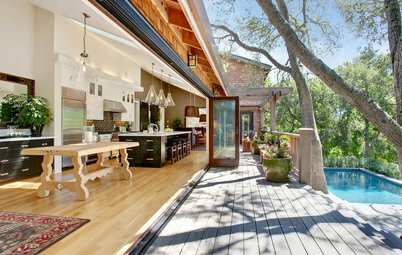 When the long summer days full of warmth and sun come to an end, it can be hard to leave that carefree feeling behind. 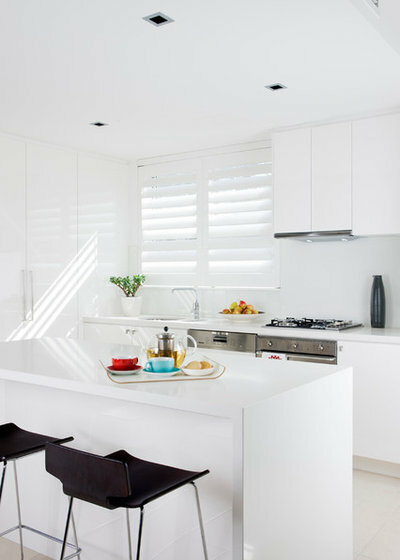 The months ahead may be cooler, but making an effort to brighten up your kitchen can make you almost as cheerful each morning as when you’re about to head off to the beach for the day. 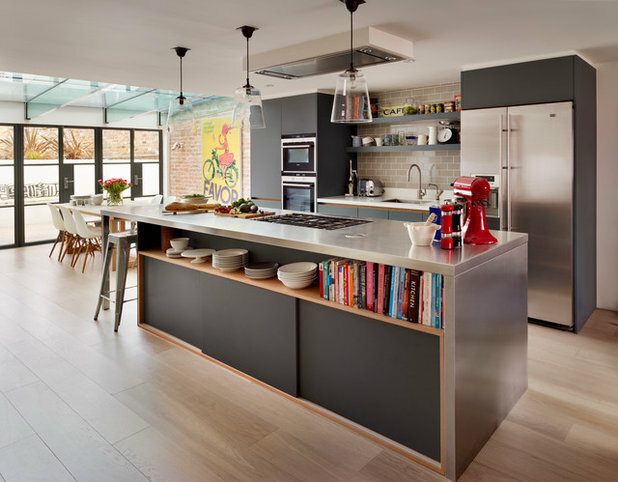 Take inspiration from these bright and beautiful kitchens, and see what you can do at your house to welcome autumn with warm enthusiasm. 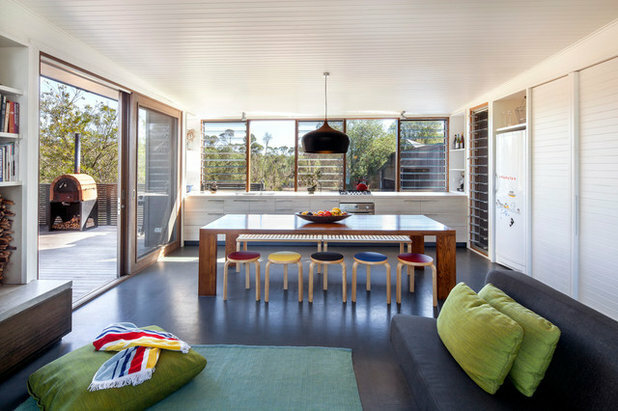 Island benches are popular for a reason, but they can become a dumping ground for household clutter that has no real reason to be in the kitchen. 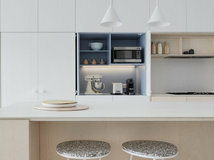 Clear away the unpaid bills, pens, little-used appliances and other bric-a-brac, and give all the benchtops a thorough scrub down until they look like new again. 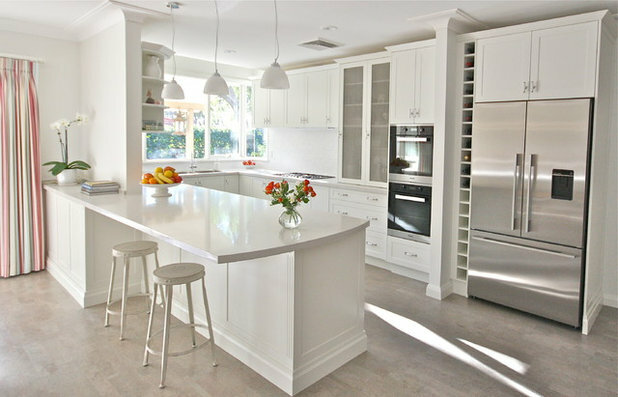 Truly clean and clear surfaces have a surprisingly uplifting effect, which helps you see the world in a more positive light. 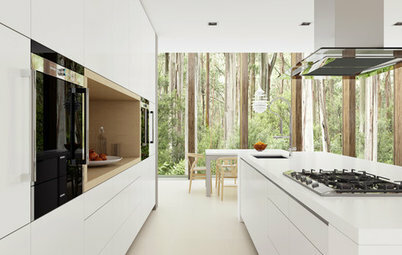 The secret of making your kitchen a more joyful place to be is simply a matter of tuning in to what makes you joyful. 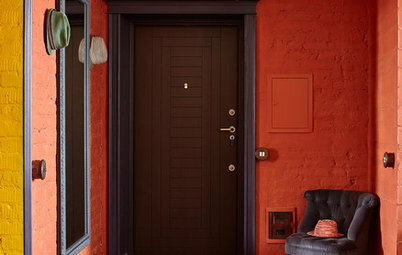 Colour often elicits happiness, but don’t be a slave to the colours you think should make you happy. Yellow, for instance, is a happy colour to some, but to others it can bring back memories of a school sports uniform they’d rather forget. 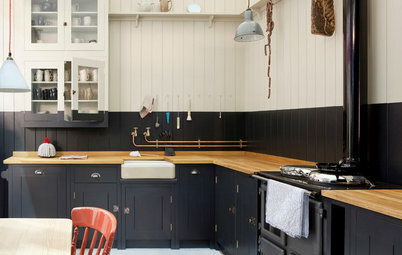 Instead, browse through the kitchens on Houzz and note which ones you’re drawn to. They don’t have to make you gasp (although that happens to me quite regularly), but you might just find one that makes your pulse quicken. 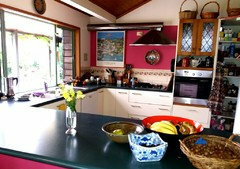 Chances are it’s the colours in that kitchen that have made you smile. 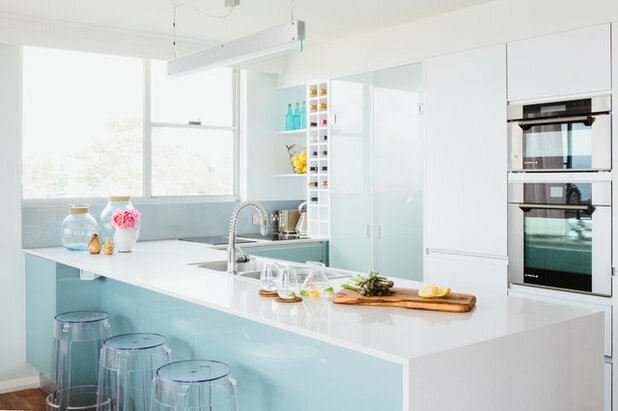 In this kitchen, dollops of pastel blue are everywhere, and the effect is pure joy. 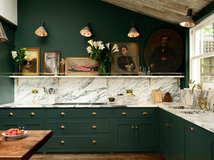 Are there ways to inject the colour you love best into your kitchen? 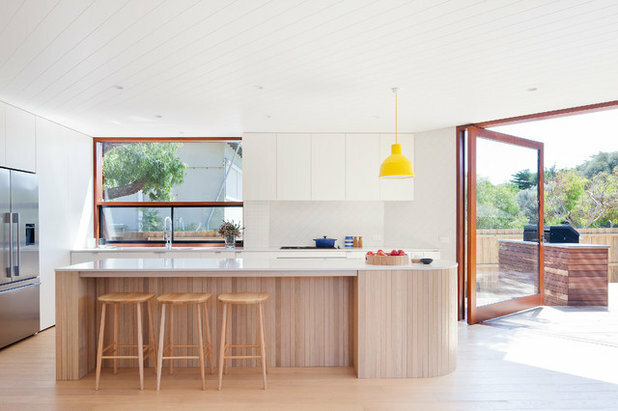 A pendant light may seem like a small thing but if it’s in your favourite sunny hue, it will have a big impact on the look and feel of your kitchen. 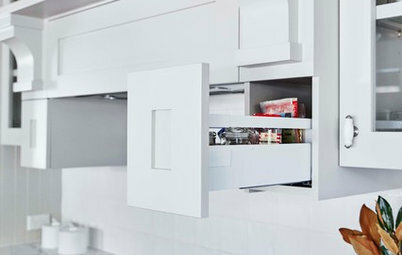 If you’ve been enjoying the benefits of daylight savings, it’s time to prepare for it to end by bringing as much light as possible into your home. 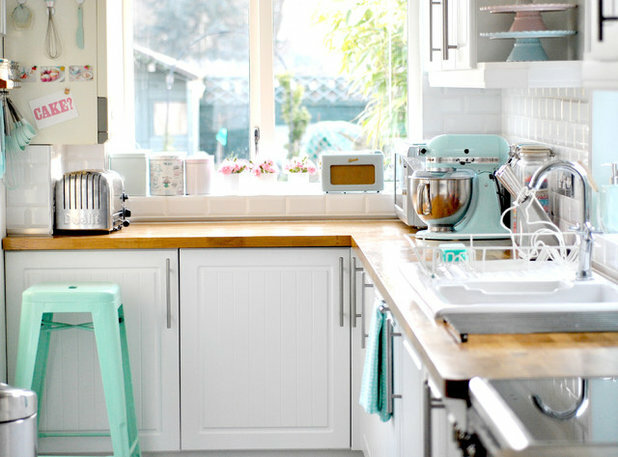 The kitchen is a good place to start. 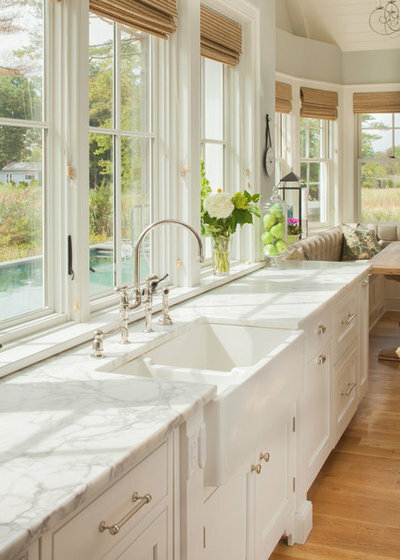 Cleaning the windows can make a remarkable difference to the amount of light that comes in. Don’t believe me? Try it and you’ll marvel at the results. 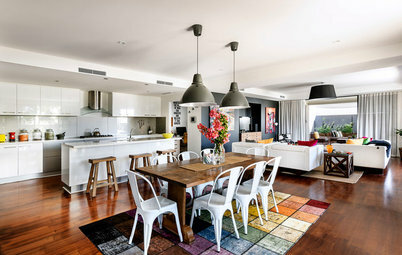 … or hang an oversized artwork that makes you smile. When the days are warm, eating light comes more naturally. But once the temperatures drop and the clothing layers are piled on, resisting kilo-inducing comfort food can seem futile. The trick is to make it as easy as possible to stay on track with your healthy eating – and that means setting up your kitchen for success. 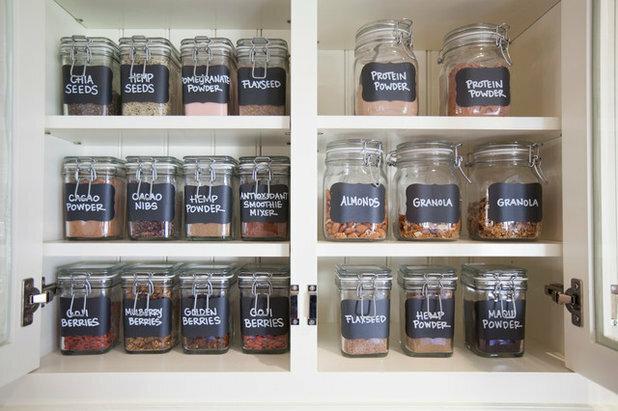 Stay stocked up on virtuous ingredients and give them the organisation they deserve. No excuses. If you’re already missing the summer sensation of devouring a sweet, juicy mango or a wedge of bright pink watermelon that drips down your face, it’s time to find other rewards that are just as blissful during autumn and beyond. Turn in-season fruits into crumbles, make scrumptious roasted vegetable salads, or go out and buy yourself a new tea set nice enough to make your cups of tea feel like a treat. Being kind to ourselves doesn’t have to involve a financial outlay, but sometimes it just helps! Fruit and flowers. 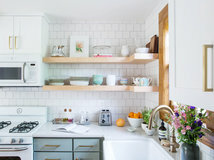 You already know these simple additions can make your kitchen jingle with joy, but how often do we actually remember to include them in our decor? Buy a bouquet more often, and keep that fruit bowl fresh and… well, fruity. 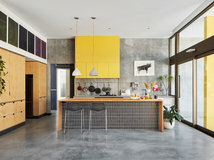 Need more proof of the happiness boost fruit and flowers can give to a kitchen? Here it is. Investing in new tea towels you love can easily enhance a positive mood. 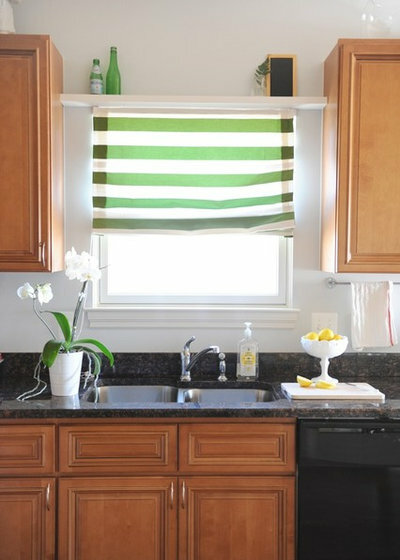 And take a good look at that curtain or blind you’ve got hanging over your kitchen window. How crisp and fresh does it look? 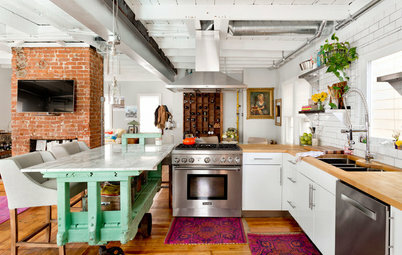 Either give it a good clean, or replace it with something so bold and bright that it becomes a fabulous new focal point. 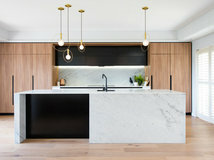 If you already love your kitchen and can’t see a way to improve it, look up. 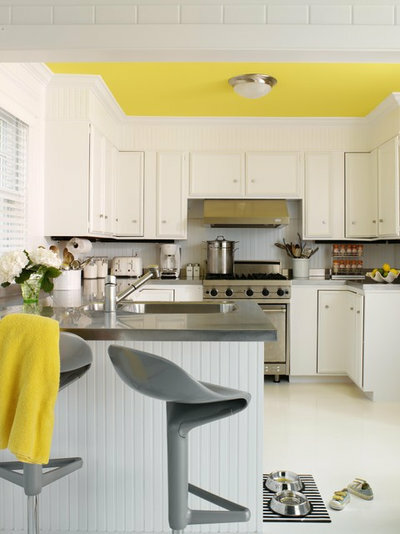 A lick of cheerful paint on the ceiling can make the sun keep on shining no matter what’s happening outside. Go on, I dare you. 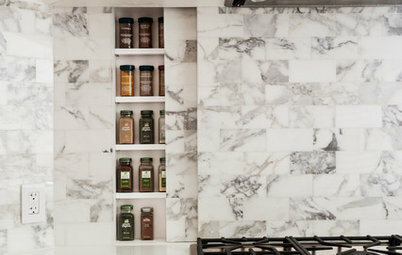 How do you make your kitchen a happier place to be? Share your ideas in the Comments. My "fiesta" styled kitchen makes me feel good anytime of year! 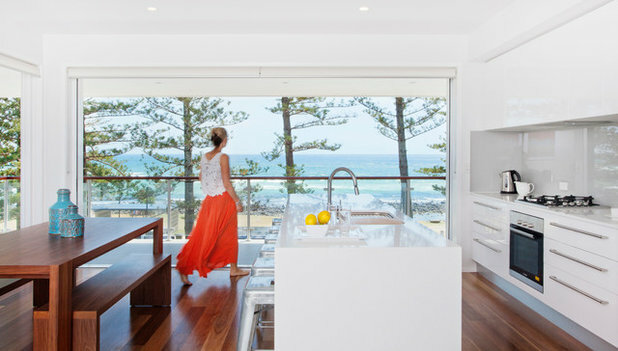 Is your property kitted out with these must-haves for Aussie living? 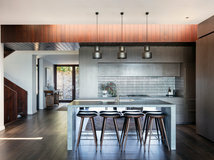 Open-plan living is all the buzz in modern home layouts, but how do you make cooking, dining and relaxing zones all work in one?